This will be of great interest to Yellowstone wolf watchers, especially because of 302’s long career, and his patent courting of the Druid Pack, until he finally joined after 21M was dead. Alan Sachanowski, who has provided so many great photos and stories about the Yellowstone wolves wrote. Here are a couple photos of a hurt wolf #302. As I understand it, he has been AWOL from the Druids for several days (more than a week), and has been up above Slough Creek probably female trolling. He made a reappearance today near Soda Butte and looks to be badly injured. He was not putting any weight at all on his left rear leg. He was first seen on the north side of the road moving west to east. He stopped on a high ridge and lay down for about an hour and a half, occasionally howling weakly. The assumption among many was that he might be trying to get back to the Druids who where up Cache Creek. I was in the Soda Butte turnout when suddenly he decided to drop down and cross the road about 100-150 yards behind me. I was able to get just a couple quick shots with a 500mm and doubler hand held. He moved across the river and into some Aspen trees on the far side where he again lay down. He was still there when I left about four pm. You can see in the photos that he is dragging his left rear leg. 302M limping near Soda Butte Creek. Photo by Alan Sachanowski. So does it look like another wolf got at him? Such is nature, but still so sad to see for this majestic creature!! Please, any updates on his condition (good news or bad) would be greatly appreciated. I’m all the way in Florida wondering how I can help him…yes, I do know the answer, but I don’t like it. As someone else suggested, he might have also been kicked by an elk or something. Well for his sake,I hope nature takes it’s course quickly. Nothing worse than an animal starving, If his injury renders his ability to hunt sub par, then that would be his fate. I would like to take the opportunity to talk about 302 and his attempt to get to his pack. I was there the morning and we saw him coming from the west to the den forest. and then as he came down the slope to TRY to cross the road. People left the footbridge and drove down to the area he was trying to cross. I radioed everyone and I know those with scanners could also hear the transmission that indeed 302 had a bad injury and for everyone to cut him some slack as he was trying to cross the road. TOO MANY PEOPLE AND PHOTOGRAPHERS DO NOT LISTEN. 302s’ travel route was impeded and he was forced to retreat uphill with alot of diffuculty. For those of you who were there and did impede his travel, I would ask you to consider having some compassion for wildlife instead of getting in their way. For those of us who stayed at the footbridge and waited, I commend you!! for not being selfish and putting our wonderful old friend 302 first. Geeze..what is going on out there? Injured wolf paparazzi? Maybe it’s time to leave this wolf alone. Another comment: people complain about the snowmmobiles causing problems for wildlife, what about this sort of behaviour from wolf watchers and photographers? Maybe it’s time to set up a winter permit system for this as well. WOW! All of a sudden my “plan” of flying out there from Florida, grabbing him, and taking him to a vet seems not so absurd. (Yes it is– it’s just desperation talking, folks!) Anyway, what’s absurd is the behavior noted in post #9 by Ms. Macaulay. Please, people, can we try and give him a chance? Please. It’s hardly a ridiculous story, but on the other hand it is clear the wolf watching in the Lamar is getting out of hand. A permit system is on its way. I meant this story is ridiculous in terms of the behaviour reported. It’s clear to me that Yellowstone winter wildlife doesn’t need to be ransacked by snowmobiles. And after hearing several stories like this the past few years, it’s clear to me Yellowstone’s winter wildlife doesn’t need to be ransacked by wolf paparazzi either. I had noidea permits were already being set up. Do you have any more information on this? Thanks. My view is that although people may have an affection for wolf 302M, he should be allowed to meet his natural fate just like the bison stuck in a Yellowstone bog, the moose that falls through the ice, or the elk that dies from a wound that came from a wolf attack. Yellowstone wildlife should be managed with as little outside help or harm as possible. 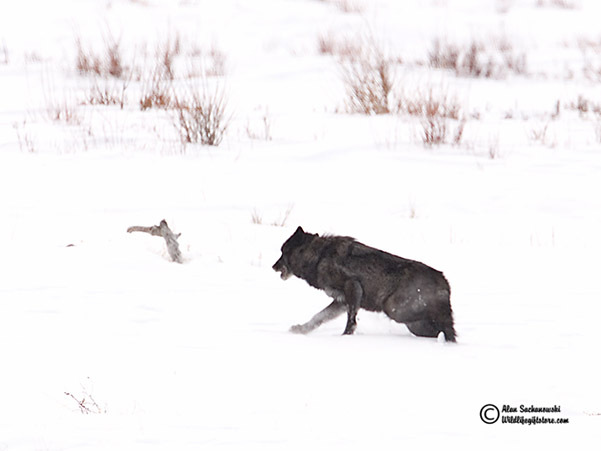 The comment about permits coming is from friends of mine who run winter wolf tours in Yellowstone. Nothing’s formal been said about it by the Park but it’s an intuition on my friends’ part that something’s going to have to be done and that sooner or later the Park’s going to clamp down on the free-for-all that now exists. I should have been more clear about that. I have no particular love for the wolf-and-pony show in the Lamar and have no difficulty with it being restricted, even severely. It’s too much the zoo atmosphere, and many of us are working hard to counter the zoo mentality that too many people exhibit about the Park. This is the type of situation that could very well result in an attack of a human by a wolf. You have an injured animal who at one point tried to cross the road and was blocked by a herd of morons. Lucky it was not summer and Joe Average from Biloxi didn’t try to get a picture with his wife and daughter petting the nice doggy. Think I’m being facetious. It happens nearly every year in the park with elk, bison, and not so much these days, bear. Unfortunately we are probably getting close to that day with a wolf in the park because believe it or not those animals become more and more habituated just by the shear numbers of people in close proximity day in day out 365. If you vote Republican under the Bush administration, you do hate wildlife and wild places. It’s not like T.R. is president. Thanks for the shot of reality– I needed it. (Your post #16) Since I’m still trying to get over the death of Two-Socks, (“Dances With Wolves”), I MAY go on being a sentimental fool, only quietly…. To comment about the 302 and the crowds. There are always a few that ruin it for everybody. As far as the permits go, I don’t think it will happen. You cannot punish the masses for the foolishness of a few. Tour groups need permits now. I don’t think that will extend to individuals. If there are a few out of control people at an athletic event, they don’t cancel the game. Fortunately, this does not happen all that often. Most of the photograaphers respect the wildlife. I live here and am in the park almost 365 days of the year. I am not a photographer. MikeH’s claim that anyone who votes Republican these days hates wildlife and wild places is both insulting and ridiculous. It’s the same kind of childish stereotype Cheney and Rove sell about people who disagree with them. How can you be a Yellowstone wolf lover and then vote for the guy who hired Gale Norton as the Interior head? From what I recall, she did some work on trying to prevent the reintroduction of Yellowstone wolves. She also stopped the reintroduction of grizzlies in Idaho. How can you love our wildlife and public lands, yet continually vote for a party that wishes to privatize these lands, road them, and gut the ESA? Who do you think puts the money into places like Defenders and NWF? The Republicans that are out working!!!! We will see how the Demos take care of the environment. I don’t need to send money to Defenders and NWF anymore, because the demos will take care of all the enviromental issues with no problem. Shouldn’t you be posting on Nugent’s forum, Dan? 302M traveled quite a distance to the north by nightfall on the 17th. He fed on an old carcass, (slim pickin’s)on the way. He has large wounds on the front and back of his left rear leg with considerable bare flesh showing. Also a smaller wound on the upper right rear leg. (I took photos from about 500 yds. with a 600mm lens and 1.7 teleconverter, then enlarged 20x on the digital viewing screen) I think these wounds were probably inflicted by other wolves when he was courting females from other packs. A comment on the alleged harrassment of 302. Maybe I arrived after, I don’t know. We were politely asked to wait. We did for about five minutes. There was no place to pull off and park.There was traffic coming up behind us. We followed a snowmobile trailer up the road and pulled off the road at the next pullout. 302 was still 400 yards away. He subsequently laid down at the top of the ridge for several hours. I saw his tracks where he later crossed the road below the cone. At this point, he was much closer to vehicles and people than I had seen him during the morning. Again, maybe I missed something, but what I saw that morning was far different than Ms. Macauley’s description. All of the serious photographers I know who frequent Yellowstone are responsible, respectful, and sensitive to the hardships wildlife must daily endure. But we are not 302’s “dear old friends”. To him, we are a temporary part of the landscape. Let’s not let our emotional attachments cloud our judgement. When “photographers” are singled out, people assume that serious photographers with long lenses are the culprits. Most of the irresponsible behavior from “photographers” I have witnessed, is from tourists with point and shoot cameras. 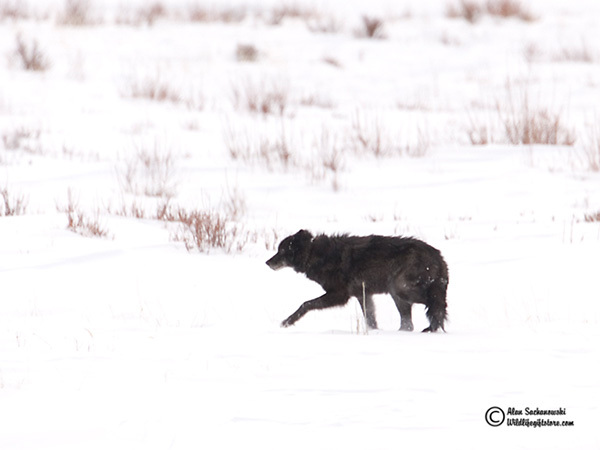 There’s no reason serious wolf watchers and serious photographers can’t get along, and most of the time we do. My recollections of that morning are similar to Chris. When I arrived 302 was already bedded down on top of the ridge and, I think, much of the earlier crowd had dissipated. I had little trouble finding a place to park and one of the volunteers filled me in. She did mention that 302 had moved toward the road earlier and may have been intimidated by the crowd. When he finally did cross, he moved down the hill and across the road unimpeded. The closet person was a gentleman with out-of-the-area plates who ran up the road past me to a position about half way between me and the crossing. 302 ignored him. I and another individual photographed from our vehicles after he was safely across. We all know that problems with crowds DO occur, however. While there will always be “idiots” in every crowd (or, as I would prefer to think of them, “the uneducated”), and while I shall always hate crowds and avoid them whenever possible (I don’t live in Montana because I like crowds! ), I had the opportunity to meet someone this fall who made me think about them in a slightly different way. I met a young man of twelve years old who was eagerly photographing a moose and calf near Canyon Junction. He was using a Canon Digital Rebel and an (relatively)inexpensive 500mm lens. He had worked mowing lawns and odd jobs, saving every penny so he could afford to buy the equipment with his own money, his dad told me. He was also voraciously reading everything that he could get his hands on regarding wildlife biology. When the boy was finished photographing I asked him, “why the big interest?” Because, he told me, when he was “little” his dad had brought him to Yellowstone and he had seen Rosie (a very visible black bear who always draws the crowds) playing with her little cubs and he wanted to be able to share that with other kids who couldn’t come to Yellowstone. What about the biology? Because, he said, his teacher told him that it was important to know ABOUT what he was photographing, not just WHAT he was photographing. That way he would know how to help protect them. I was so damn impressed that my eyes were welling up. The animals of Yellowstone are much more than that. Bears like 264, Rosie/Sarah (and the long line of Rosies dating back to at least the 1930’s) and wolves like 21, 42, 113, 302 and others are great ambassadors for their species. As for crowds? I still don’t like them; but I can’t look at one without thinking: how many of those people (children or adults), right now, at this very moment, are having their hearts softened; are having a life changing experience? Even if it’s just one or two, isn’t it worth it? Sure, the Park and the animals would be better off if they never allowed another person in. Not a tourist, not a ranger, not a photographer, not a biologist. But would that be the best course for the future of conservation? Some controls definitely have to be in place, but people have to care about what they are asked to preserve, and if a picture is worth a thousand words, then seeing it with your own eyes must be worth ten thousand times ten thousand of that. Great story Alan. I believe the true ambassadors of Yellowstone are its wildlife. Many times I have heard stories from visitors about bear or wolves and it’s this that changes people views about wildlife and wild places. I was in the park last weekend and saw 302. The old boy evoked compassion from everyone who saw him. A wolfs life is very hard. Katherine is correct and her story was exactly the way it happened. As a result, the researchers, regulars, and volunteers stayed off the radio’s for several days. If everyone would follow the park regulations, there wouldn’t be a problem. Chasing, blocking or interfering with any wildlife, including wolves that are attempting to cross the road or travel ina particular path is against park regulations. Using scanners to listen in on the radio communications is not a problem. Where it becomes a problem is when visitors use the information about wolves crossing the road to then race up and block the wolves or wolf from crossing in an attempt to get a full face or close up picture. We are seeing this more and more each year. There seems to be this competition to see who can get a really close up photo and then post it on the web. Regardless of the harm. My personal opinion is, photo’s of wolves should not be posted. Maybe this would cut down on the competitiveness.